There was snow on the forecast, but I decided to attempt a hike for sunrise, to capture what I could of the morning light. The drive out to Canmore was cold, wet and dark. I parked at the side of the road near the trailhead, and bundled up in the driver’s seat for a frosty night. The chill crept slowly into the vehicle, so around 4:00am I set off. My headlamp securely in place, I stumbled through the dark up the trail. My progress was hampered by snow. While crossing a boulder field, the wind swept the snow into a frenzy, erasing my path from view. Using only my compass, I blindly continued. Eventually, I made it to my chosen viewpoint: Wind Tower. The snow subsided but the heavy clouds blocked any of my hope for a firework display of reds and oranges. 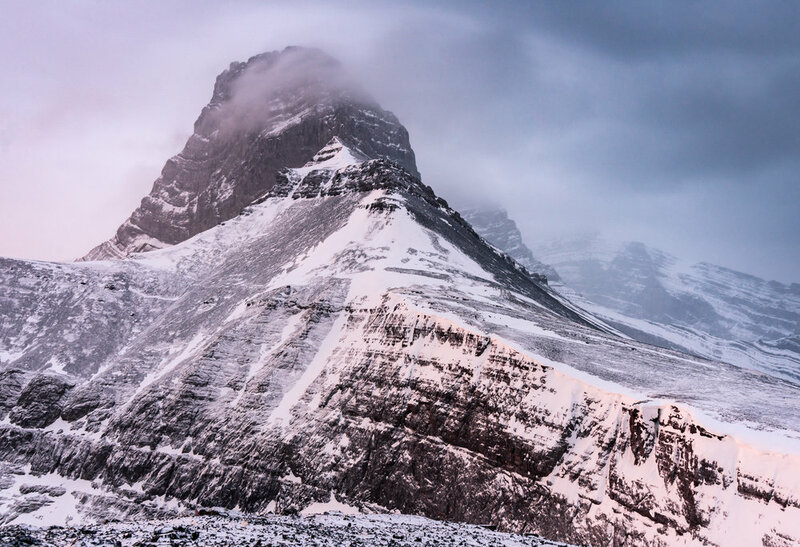 Instead, a faint purple glow of the rising sun gracefully illuminated the face of Mt Lougheed. To capture the dim light, I set up my tripod and camera for a long exposure. This image, to me, represents how hard work and a little risk taking can produce stunning results.